Virginians! 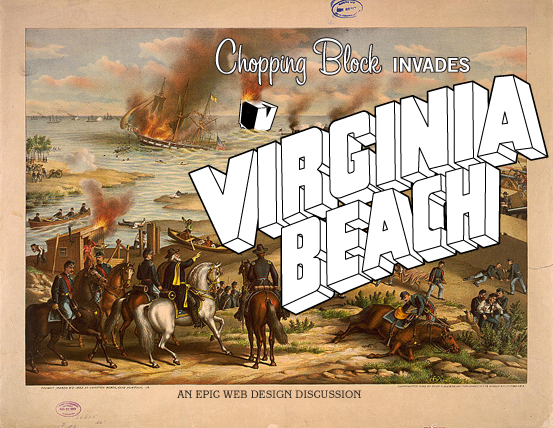 I will be speaking this Thursday at AIGA Hampton Roads in Virginia Beach, VA. I will be presenting on “Web Design for Non Web Design People”, my ongoing quest to demystify the complexity of web design and provide some real-world direction as to what designers should be doing and learning to increase their comfort and experience working online. If you plan on attending, stop and say hello. Update: Thanks for all the great feedback, everybody in Virginia was most excellent – AIGA Hampton Roads is a force for good. As promised I have uploaded the slide deck from the presentation (click here), have fun. It was absolutely brilliant. I’m basically telling everyone I make eye contact with how much I enjoyed it (and making sure they know how badly they effed up by not coming). Can’t wait to order my Hellbotica shirt. I plan on wearing it when I go skydiving for my birthday next month. It’s important to look like a badass when you’re behaving like a badass. Come back to Virginia soon (and next time, I’ll cook).